New Xbox To Deny Used Games? No one knows for sure, but it’s one hell of a ball to drop if the rumors turn out to be true. According to Kotaku, a “trusted source” told Kotaku that along with the next Xbox supporting Blu-Ray and a new Kinect, the system would reject used games if the player happened to put one in. A rep emailed Kotaku later on with the usual PR bullcrap and dodging the speculation with, “Beyond that we don’t comment on rumors or speculation.” If the the no-used game feature is true, services like Gamestop and GameFly would suffer immensely, GameFly especially. 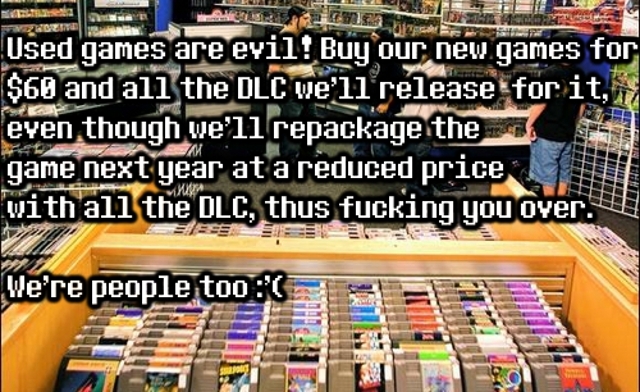 Since this generation began, publishers has been fighting tooth and nail to halt the selling of used games with DRM, Online Passes, or simply skipping retail and selling online only. This would be the first time in consumer electronic history that used products would be banned. This entry was posted in Gaming News and tagged activision, Capcom, ea, gamefly, gamestop, Microsoft, Ubisoft, used games, Xbox, xbox 720 on January 25, 2012 by Steven T..